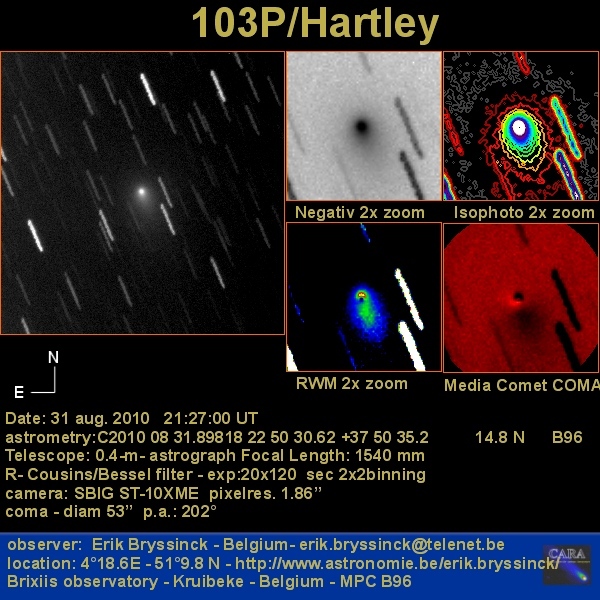 In October, Comet 103P/Hartley 2 will be bright. Well, "bright" for a community that thinks anything that can be seen with a telescope of less than 1 meter diameter is bright. 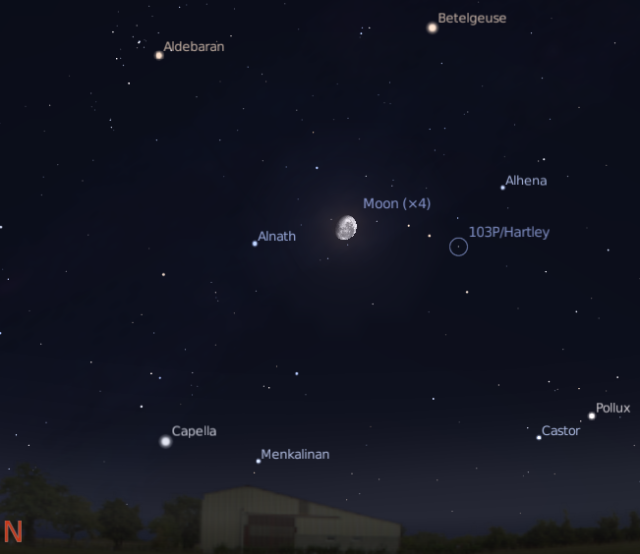 In reality it will be a fuzzy dot readily visible to the unaided eye at dark sky sites, and just about visible to the unaided eye at suburban sites, although it will be readily visible in binoculars. Now, while it won't be a comet McNaught, it will still be a comet visible to the unaided eye, moving rapidly through some every interesting territory, and even binoculars may reveal interesting details. It's been a while since we had one of those. 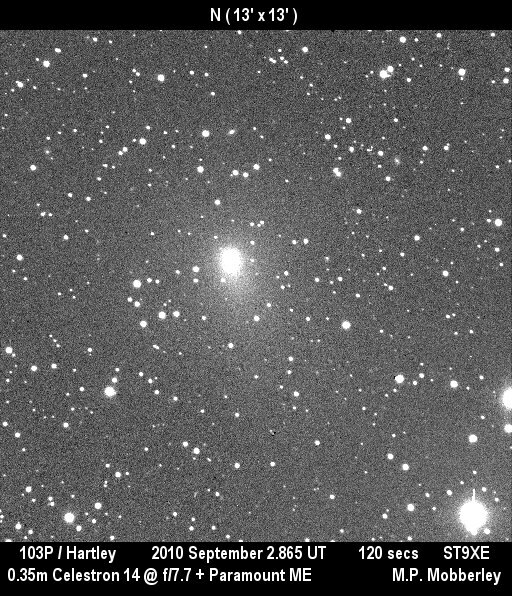 Comet 103P/Hartley as seen from Adelaide on October 28, 2010 at 3:00 am, ACST (similar views will be seen elsewhere in the southern hemisphere at equivalent local times). 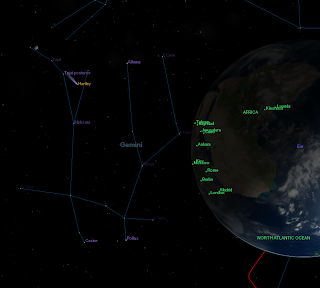 Visualised in Stellarium. 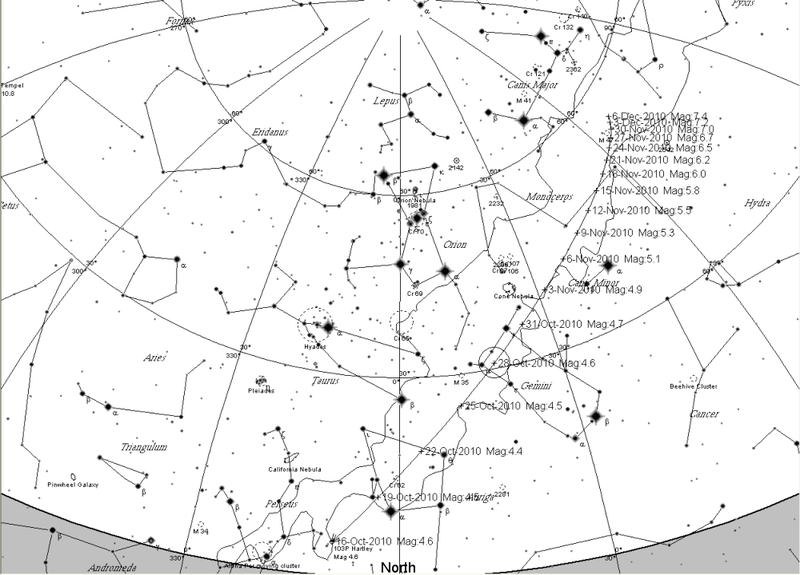 Sadly, the Moon will substantially interfere between the 21st and 30th, when the comet is at its brightest. 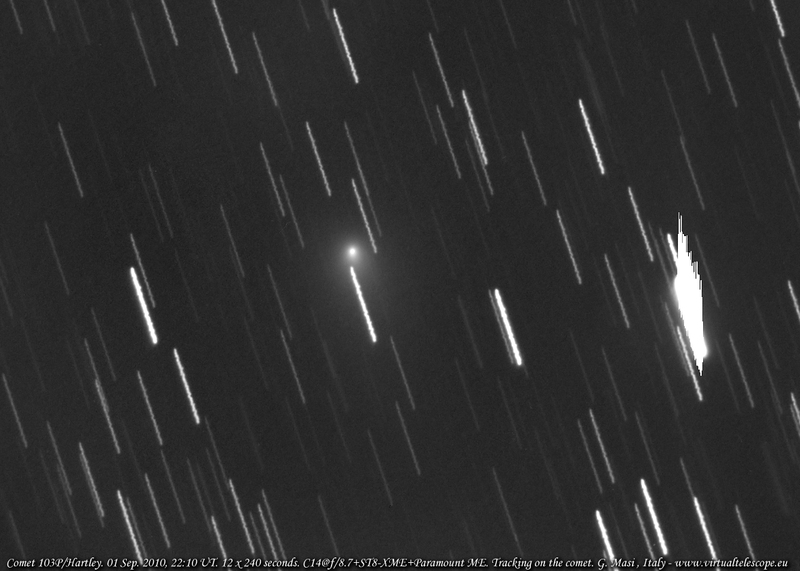 The southern hemisphere gets a good view of this comet when it is bright (at the moment it is low on our northern horizon). Spotters map of 103P Hartley in black and white, suitable for printing out (you need to click to embiggen and print the embiggened map) . Alternatively you can download this PDF Map. If you want to add 103P Hartley to Stellarium or Celestia, here are the elements for those programs. For stellarium (works in versions 10.x and 9.x) just copy and paste the section below to the end of the system.ini file. 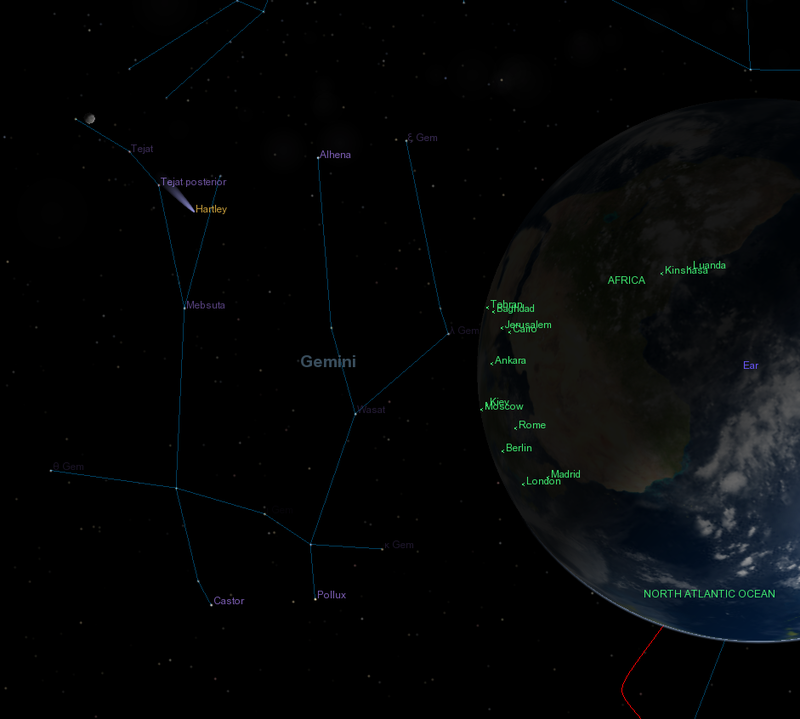 When you run Stellarium, you will have to turn planet hints on in the configuration menu if they are not already on. For Celestia the .ssc file goes into the extras folder. Note that the albedo and diameter are wrong in the Stellarium add-on, but it doesn't give me the right magnitude if I use the real values (This also happened for Encke). UPDATE: The original Stellarium add-on was screwy (see comments), so I rebuilt it from scratch with new MPES elements, it works now (ie 103P Hartley in Stellarium is within 5' of the CCD image position with the elements in the revised). Great Blog you have here very useful, well done! 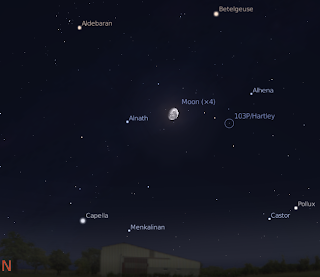 I took some images of 103P/Hartley and compare with Wikipedia ephemerides for Stellarium. The data is off by substantial amount (~20 min and 0.5 deg)! I've also replied over at Sourceforge. As I said there, juts replacing that figure didn't help much, using your add-on was much much better, but in the end I rebuilt the add-on from scratch with new MPES elements. 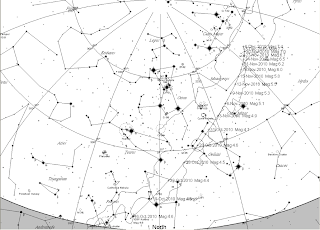 Who knows what happened, but it's not a stellarium problem. Thanks for the help.